Harley-Davidson, the company notorious for its big, and loud American motorcycles, outlaw image and tough demeanor are presently evaluating the opportunity of expanding their product portfolio further by penetrating into the market of E-Bikes and electric scooters. Following the positive introduction of the electric LiveWire motorcycle at this year’s CES Show in Las Vegas, the American company are keeping their momentum going and has recently revealed their intention to move forward with plans to manufacture eco-friendly and thrilling rides for their present and future customers. In January, Harley-Davidson released images of two visually striking lightweight electric transportation concepts that resemble slimmed down motorcycles, and electric bicycles without pedals. Although no date as of yet has been given for the commercialization of the design concepts, prototypes have been seen in Aspen, Colorado during the Winter X Games. 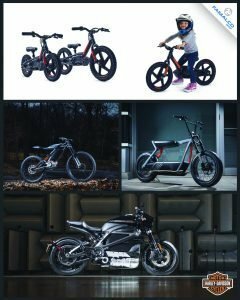 Following an announcement of the acquisition of StaCyc, an electric balance bike manufacturer for kids, Marc McAllister, Vice President of product portfolio at Harley-Davidson has publicly stated that the prospect of electric bicycles is “a huge opportunity”. Whilst any company considering product diversification is aware of the challenges presented when evaluating such a strategic move, Harley-Davidson’s story, industry know-how as well as their long-term vision create the perfect foundation to manage this shift without making it an expensive exercise. The shift to go green within the transportation industry is no longer part of the customers’ wish list but is now a demand. It is the perfect opportunity for Harley-Davidson to present itself to the eco-world of green-business with this innovative product line. http://famalco.net/wp-content/uploads/2019/04/HD-Photo-with-tag.jpg 1479 1181 Mathew Mithun https://famalco.net/wp-content/uploads/2016/05/famalco-logo-1.png Mathew Mithun2019-04-02 08:55:132019-04-02 08:55:13Harley-Davidson evolving towards a greener future.